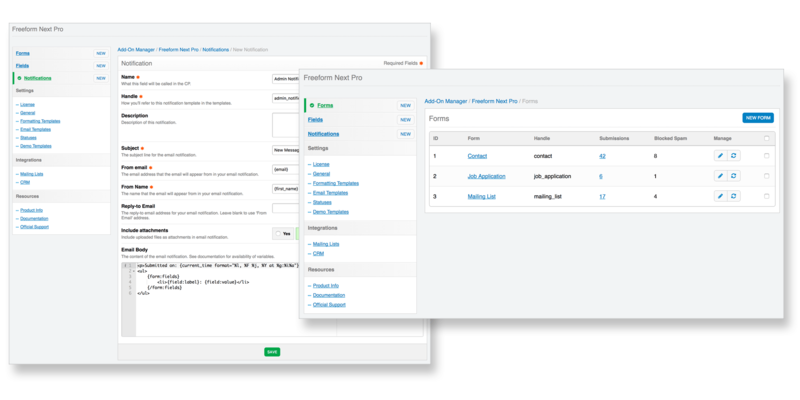 The most reliable, intuitive and powerful form builder for ExpressionEngine. 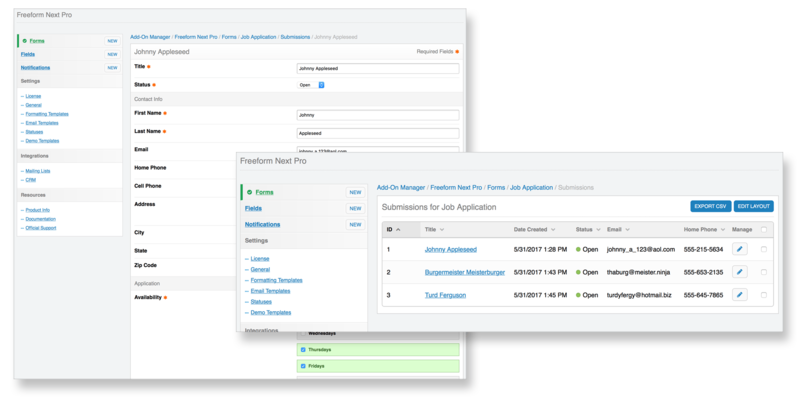 Freeform is the most reliable and powerful form building add-on for ExpressionEngine. 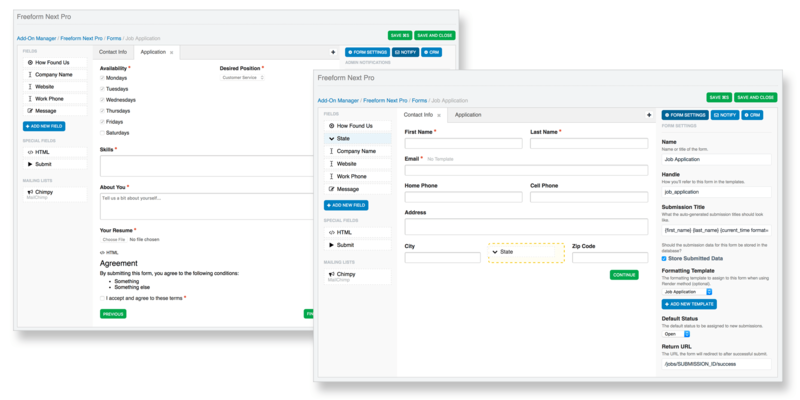 It gives you full control to create simple or complex multi-page forms, as well as connect your forms to many popular API integrations. Ready-to-go templates and features will have you ready in minutes! Robust form building is a breeze, yet powerful for all needs! 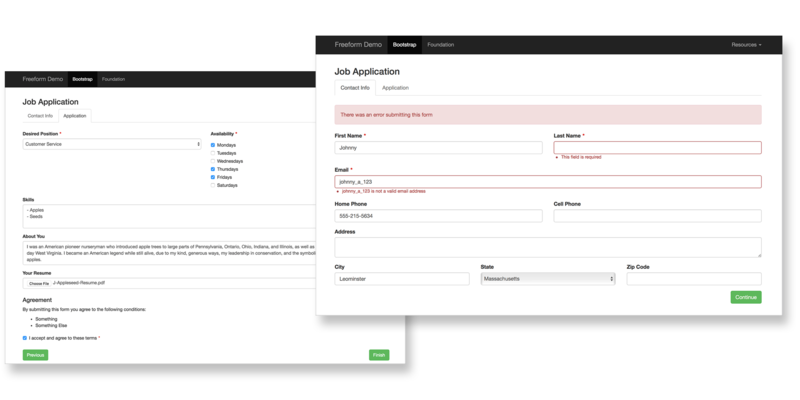 Templating is easy and highly customizable for even complex forms! Connect forms to popular CRM and mailing list services! Everything is at your fingertips inside the intuitive and powerful Composer form building interface. 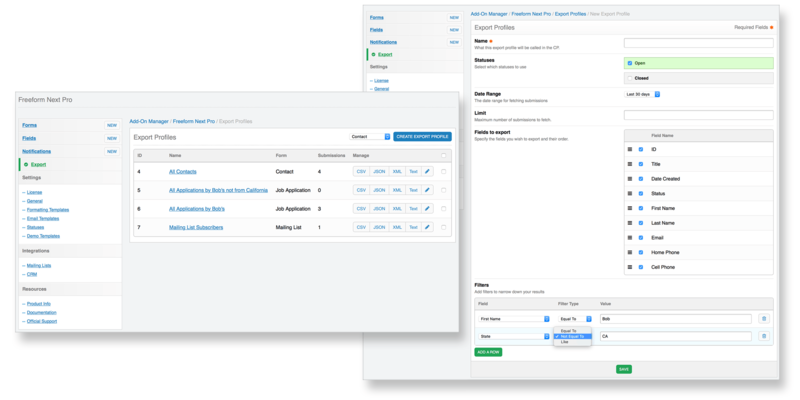 It gives you full control to create and live preview simple or complex multi-page forms. Templating and email notifications are flexible and powerful. Freeform Composer is a fun and intuitive drag-and-drop interface, like none other. 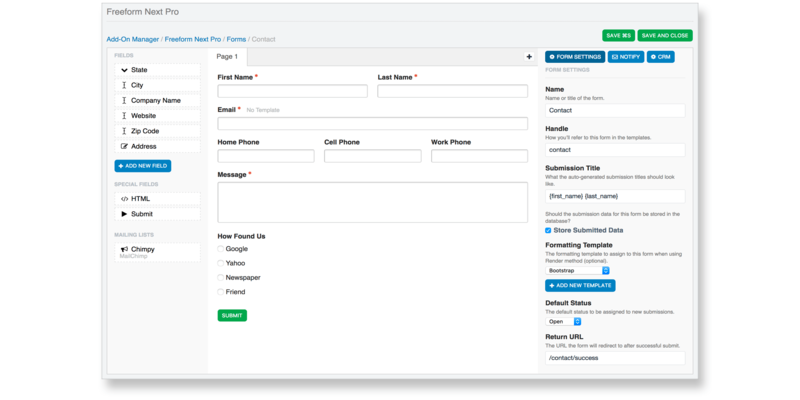 Easily build complex multi-page forms. Build as many different email notifications as you need, and send up to 5 different types of email notifications! Connect your forms to many popular CRM's and/or Mailing List services! Several general configuration options to match your preferences! Never miss an update! 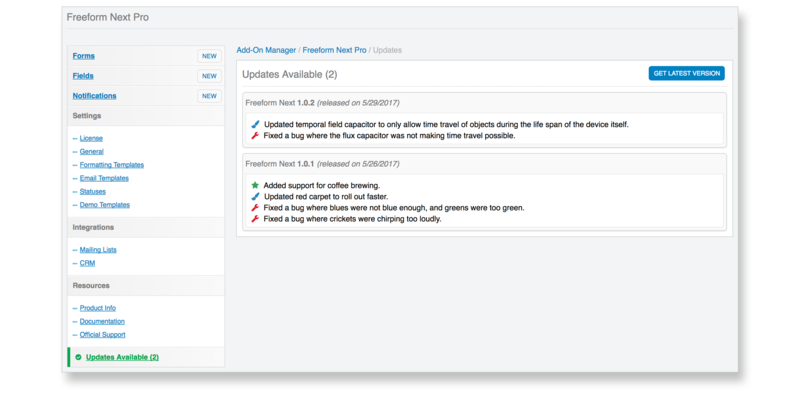 Freeform includes its own Updates service built in. † Support tickets will typically receive first response within this timeframe or sooner, based on business days. You can keep using the last version you downloaded, forever. Each purchase of Solspace software includes 1 year of support from the date of purchase. We pride ourselves on our level of customer support, and strive to offer the highest level of support for our customers! Here is an overview of how product support and our support levels work. Support level times indicate typical first response times. While we try our very best to answer support tickets as quickly as possible, and in most cases will meet or exceed these timeframes, we currently cannot guarantee them as there are factors that can delay this, such as volume of support tickets, holidays, and critical issues for others, etc. If your purchase is eligible for Fastest support service, your tickets will have a higher priority and will go ahead of Fast and Standard tickets. Most importantly, we strive to resolve all issues reported to us as quickly as possible. However, depending on constraints or complexity of the issue(s) reported, in some cases it may take up to several days for a solution to be available. Your ticket goes ahead of Fast and Standard support tickets, and you will typically receive a response within 1 business day or sooner, and we’ll work to resolve the issue as quickly as possible. Your ticket goes ahead of Standard support tickets, and you will typically receive a response within 2 business days or sooner, and we’ll work to resolve the issue as quickly as possible. Your ticket will typically receive a response within 3 business days or sooner, and we’ll work to resolve the issue as quickly as possible. While you may sometimes receive support outside of business days and hours, our product support is officially available between Monday-Friday, from 8am-4pm CST. In the unfortunate scenario where we are unable to resolve the issue for you, or if our product just isn’t right for your needs, we offer a 30 day satisfaction guarantee. Just let us know within 30 days of purchase, and we’ll provide you a full refund. Before submitting a support ticket, we strongly encourage you to carefully review the documentation provided. 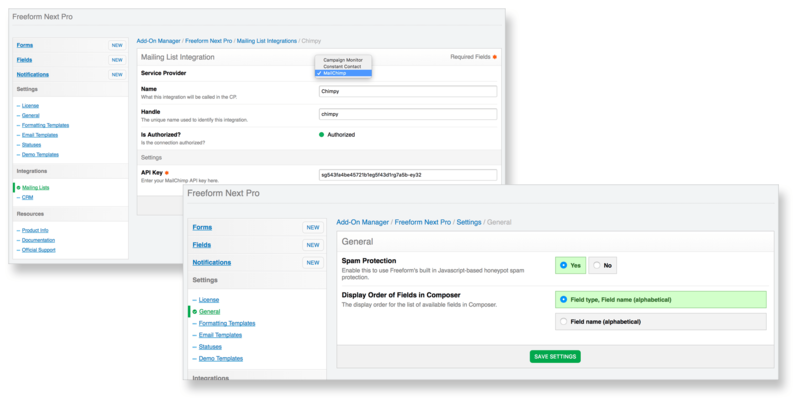 For some add-ons, we’ve included a “Common Issues” documentation page to cover issues that customers more frequently run into. If your question is more of a “how-to” question that goes beyond the scope of our support, we encourage you to try posting on the Stack Exchange site available. We do not guarantee a response from Solspace here, but we do try to help as much as we can. If you’d like to provide feedback, a bug report, ask a pre-sales question, or if you’re experiencing an issue, please submit a support ticket to our Private Helpdesk using the Support form page provided. When submitting a support ticket, please provide as much information as possible, and be specific with CMS and add-on/plugin version numbers (not just “latest”). Our support service also assumes a basic understanding of the CMS, templating and HTML/CSS skills. While we are always happy to help, it’s very difficult to provide support for someone who is not at all familiar the aforementioned knowledge. Should you require additional support beyond the 1 year term, you may purchase an upgrade, renewal (if available), or additional license for your product. Each purchase of Solspace software includes 1 year of updates from the date of purchase. Once that year is up, you can keep using the last version of Freeform you downloaded, forever. If you'd like to continue to receive additional updates and support for Freeform, you can purchase a renewal for another year at 50% discount (from regular new purchase price). We pride ourselves on our level of customer support. Ask anyone around the ExpressionEngine community. We simply strive to offer the best support for our customers! We're so certain you'll love Freeform, we guarantee it! If Freeform is not right for you, just let us know within 30 days of purchase for a full refund. We've been developing, maintaining and supporting software for over 10 years to over 10,000 customers! Over 300,000 add-ons have been sold or freely downloaded. How many sites can I use my license on? If I buy Express or Lite now, can I switch to Lite or Pro later? Yes! The Lite and Pro versions just add onto the functionality available with Express and Lite. To make the switch, you just need to purchase the Lite of Pro upgrade for the difference in price. This can be done by visiting your Account area. We currently do not offer any trials, but we do have a 30 day satisfaction guarantee. If you're not satisfied, just contact us within 30 days of purchase for full refund. Can I switch from Classic? Yes! The new Freeform includes a migration utility that allows you to migrate most of your Classic data over. See documentation for more information.